As parents sometimes do, they decided that they would like another child and so in 2007, their second son was born. I was in a quandry. I knew this baby was coming, but I had been in a quilting funk for quite a spell; my quilting muse had deserted me. So, there I was ... in a quandry. What to do? What to do? There were, of course, millions of layouts and techniques that I could do but I really do like to personalize the quilt to the recipient in some way. A generic layout, however pretty and nifty, would not do. Therefore, I stewed. And I thought. And I was feeling mildly panicked because, since I made the first baby some quilts wouldn't the parents (my friends) have some reasonable expectation of at least one quilt for their new baby? I'd sure think so. And then it happened! Oh hallelujah, inspiration descended! 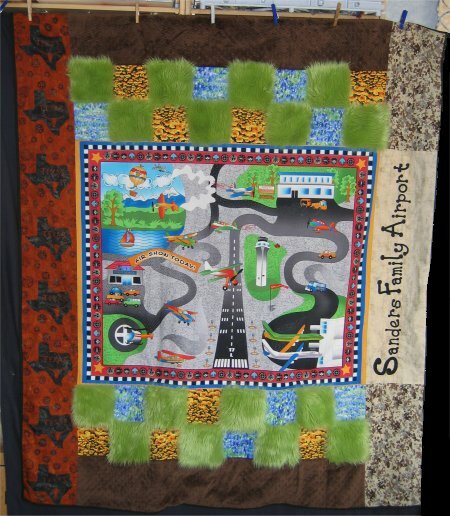 :-) In January 2008, I saw an ad in one of my quilting magazines for a panel print for the layout of an airport! This was absolutely PERFECT. The Dad is an Air Force pilot (now in the Reserves) and a FedEx pilot, so the airplane theme was sooooo appropriate! Alas, I wasn't to be put out of my misery too soon .. since the ad had just come out in January, none of my local shops had it yet. In fact, the few quilt shows I went to didn't have it either. I was thinking seriously of ordering it online. 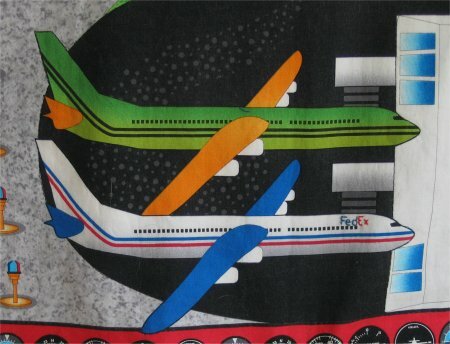 The fabric line is from Avlyn and is the "Airport" line. The complete collection can be seen at Avlyn's website. 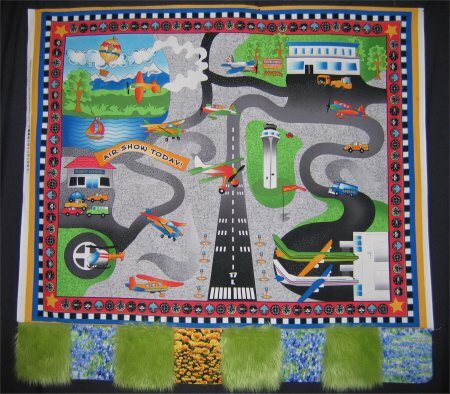 Since most quilt stores won't be carrying the entire line, you can use Quilt Fabric Search Engine at www.quiltshops.com and use the keywords "avlyn" and "airport" to see which stores have which lines. But then in February, I attended the annual Arizona Quilt Retreat (for us About.com's Quilting forum members) and happened to mention my plight. One of the other retreat participants, Ellen, works at a quilt store and said that they HAD THE PANEL IN STOCK! I nearly died of delirium. Ever gracious, she called her shop right then and had them set aside a panel for me. (at the time of this writing, July 2008, memory fails me slightly and I don't quite remember if I subsequently ordered companion prints from them or not, but I did eventually get some). I did have to wait until after the Retreat to get it/them in the mail, but that was just fine with me ..... I was now on my way! Once home from the retreat, I used Electric Quilt to design a preliminary layout and printed it out for myself with notes to remind myself of the details (subject to change as reality presented any Real Life problems). From the beginning, I knew this wasn't going to be the kind of quilt that you would look at and be overcome with its awesome beauty. :-) Nope, this quilt was going to be a playmat ... a practical and, hopefully, enjoyable quilt for the two boys to play with .. lots of tactile, touchy-feely pieces and a starting point for their imaginations to soar. To that end, I began to think about airports. Where were they and what was the land around them like? Well, typically speaking, airports are on the outskirts of town. We don't want the airplanes trying to land where people are (let's just not even talk about airports that do that!). Therefore, there's going to be lots of empty space around the airport .. probably grassy and/or dirt areas on the ends where the runways are. I knew I had seen the perfect fur at my local Joann's that would serve nicely as grass. Alas, by the time I was making the playmat, fake fur was out of season and Joann's didn't have it in stock any longer. Not a problem, said I, I will simply order some online. Who knew that finding green fake fur in a grass color would be so doggone difficult to find? Finally, finally, I found some at Distinctive Fabrics in their long fur category. Although the price was steep, I figured I only needed about a 1/4 yard, so I'd spring for it. OMG ... I was floored to discover that the minimum cut was 1 yard. 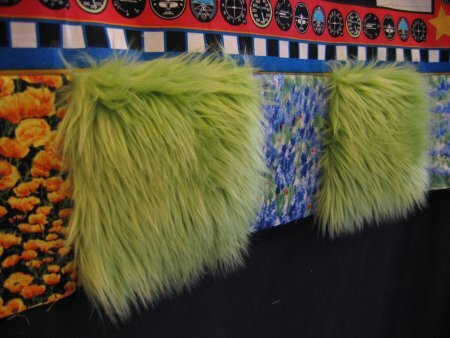 What the HECK was I going to do with 1 yard of green fake fur???? Well, cost or not cost, I needed to have THAT fur for my grass. When it came in, it was the most WONDERFUL stuff I've ever fondled! It was long and silky and moved through your fingers .... oh, gosh, it was sensuous! 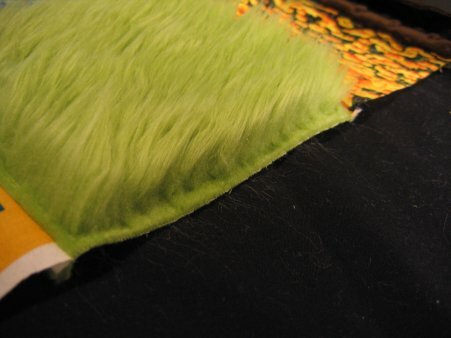 (In that picture, you'll also see where I clipped off the fur in the seam allowance for easier sewing.) You can see how long> the fur is ... it's 2" long!! ... and a great contrast to the adjacent flowers. I figured that sprinkled amongst the grass there would probably be some flowers. 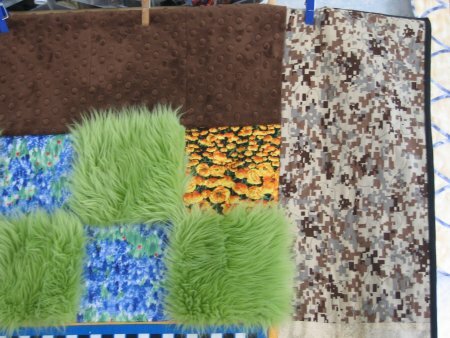 Now since this is MY quilt, I can decide what flowers co-mingle with the grass. 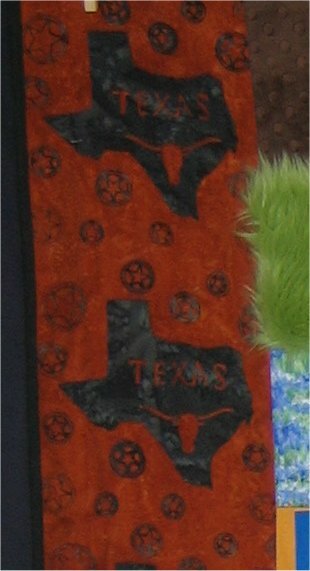 As this quilt is coming from California and going to Texas, I chose flowers from those states ... golden California poppies (one of my favorite wildflowers) and Texas bluebonnets. 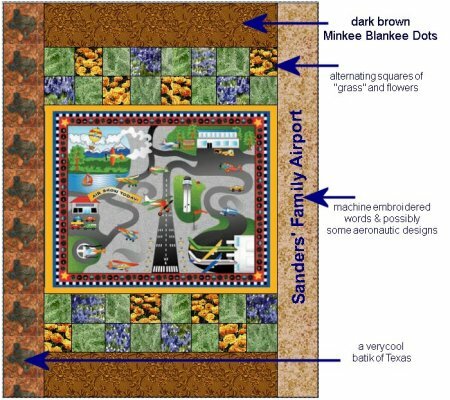 I alternated squares of flowers and grass on either end of the airport runways. Along with grass, I figured that there's problably some dirt. I used raised dot Minkee Blankee in dark brown for this. As with the grass, Minkee Blankee is incredibly soft and with the raised dots, it has some tactile texture ... just the thing for young fingers to experience! So, there's a strip of dirt on either side of the grass-and-flowers. In that picture, you'll also see a strip of desert sand camouflage fabric that I will mention later. The airport panel itself is delightful ... it has hangers, a control tower, a runway, hot air balloons and airplanes flying overhead. I must admit here, before God and everyone, that I tend to be a snob about panel prints as quilts. I tend to think they are a cheat; after all, they ARE printed on. Well, even I will succumb to a panel print when its just so perfect for the project. Name on the airport and airplanes flying banners. Every airport needs to be identified and so there is a billboard with the airport name on it. Look up in the sky! There are 2 airplanes towing banners with each boy's name! 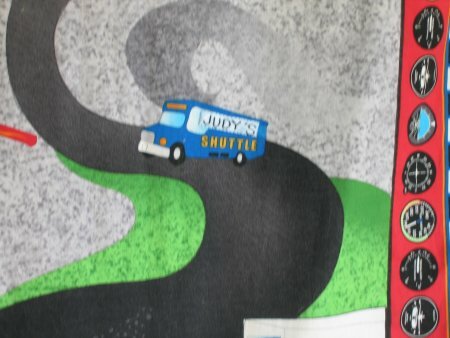 Judy's shuttle.Just like any stay-at-home Mom, one of Judy's functions is a taxi driver. At the Sanders' Family airport, it's to be the airport shuttle dirver. Commercial planes. Every big airport not only has personal aircraft but the big, money-makers like FedEx. Since Dad (Harold) is a FedEx pilot, he has his plane parked at the FedEx distribution warehouse, ready to be loaded up. A flight school. 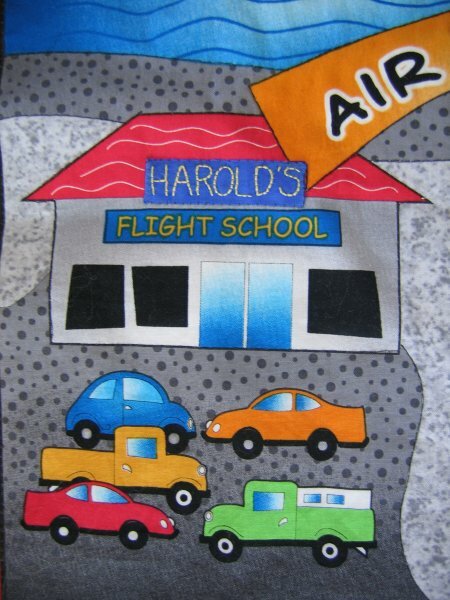 To bring in more revenue, you need to have a flight school and so hard-working Harold has one. Or is that hardly-working? :-) Look at all the customers he has! He better start working! Military plane! And what self-respecting airport doesn't have a military jet buzzing the tower? Look up! It's an Air Force F-15 Eagle! How appropriate, since Harold is also an Air Force (now Reserve) pilot. This is not hand-embroidered but a machine-embroidery design that I stitched as a stand-alone applique and zig-zagged onto the panel print with monofilament thread. Unfortunately, the web site where I got this delightful design isn't around any more. The fabric for this embroidery is a very granular, sandy sort of looking fabric ... perfect for another sort of dirt, don't you think? But, I didn't have quite enough for the length of the quilt and if I was going to need to piece it, why not do something interesting with the piecing? 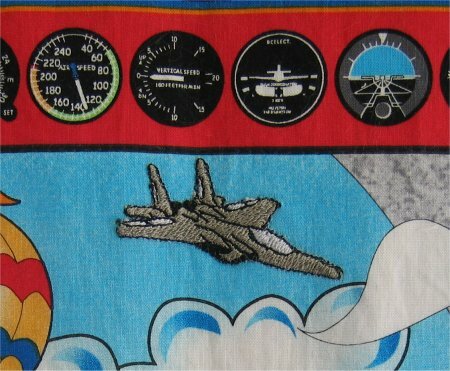 After thinking about this for a while, I decided that I would use desert sand camouflage fabric on either end of the machine embroidery strip. 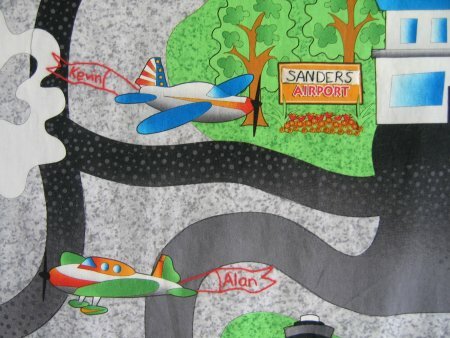 Since the Dad is military, I figured that there would probably be maneuvers taking place around their airport. Can you see the maneuvers? No? Well, silly, that's cuz they are camouflaged! As this playmat is pretty big (63"x66"), I wanted it to be more convenient to tote around than simply folding it up into a bundle. So that this convenience could be accomplished, I made the entire quilt into a quillow ... a quilt that has a pocket on the back, which when you fold the quilt up properly, you can then stuff the quilt into the pocket so it becomes a flat pillow. Then I thought that it would be very helpful if the toys could be put away with the playmat, but an open end on the pocket wouldn't work. 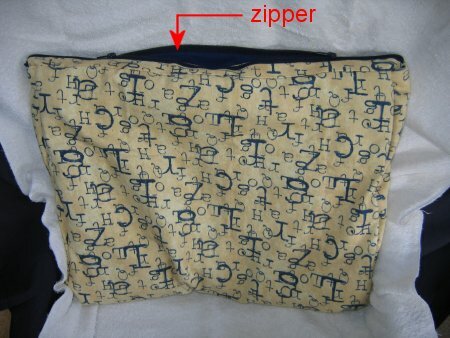 After a LOT of thought, fiddling and annoyances, I finally was able to put in a sports zipper across the open end of the pillow so that when closed, the toys wouldn't fall out and get lost. On the back, I put two labels ... a rather LARGE one explaining all the details, otherwise, how would they know to look for them? :-) ... and my usual pirate label. With that, the playmat is finished.